Sophie Divozzo receives council level award from knight Zachary Good. 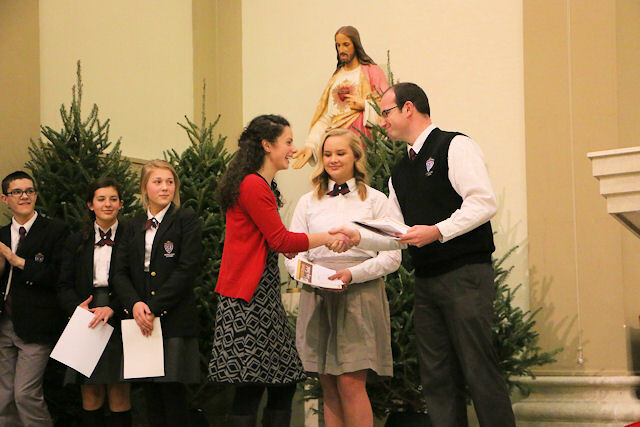 Sacred Heart council is proud to announce that two of our council essay contest winners from Sacred Heart academy have won their grade level at the state competition and are now entered in the international Knights of Columbus essay competition! The Sacred Heart Knights will again be sponsoring this essay competition starting in September 2016. Watch for further details in the bulletin and academy newsletters.